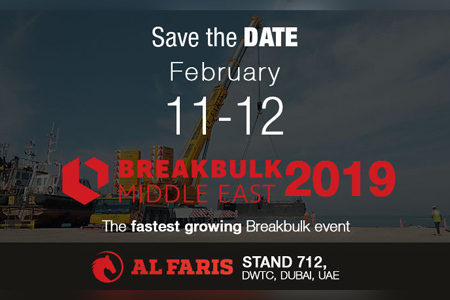 Awarded to commission and provide solutions for lifting of various complex structures constructed at ground level weighing between 100 to 160T and spanning between 2000M2 to 3500M2. 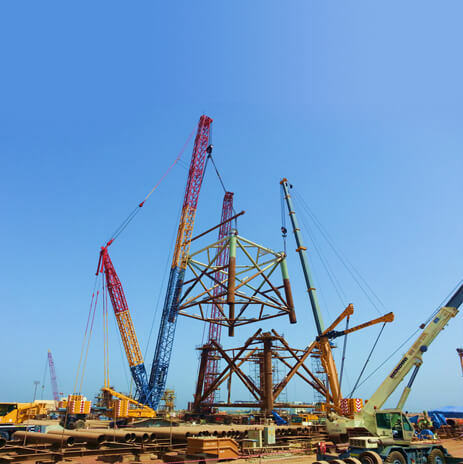 The major challenge was calculation of lifting points and weight distribution on the multiple cranes used and thus proposing suitable equipment at each position. 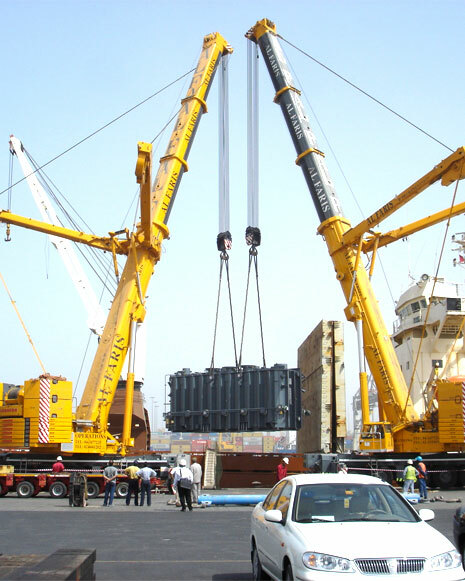 We calculated load distributions at various lifting points and planned selection of appropriate cranes for use. 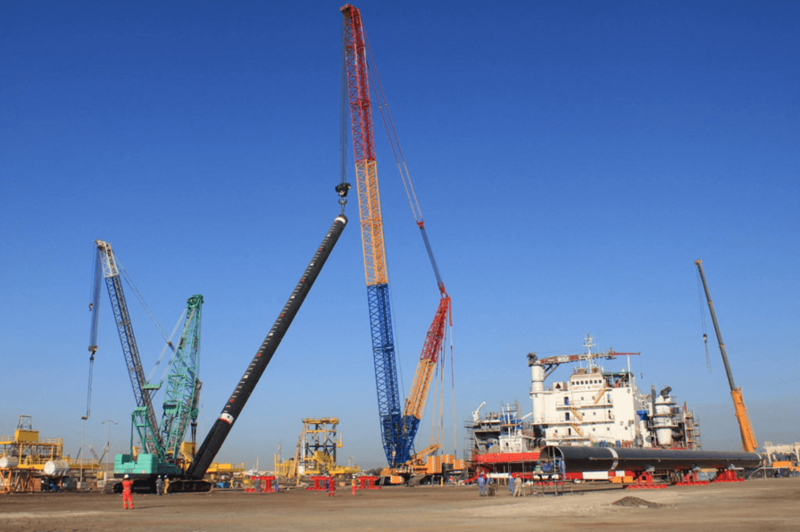 A combination of 4 Liebherr mobile cranes were used; 2 x 250T, 400T and 500T with main boom and luffing-jib that successfully lifted the structures. Numerous site visits were done to carry out technical assessments and structural calculations for a custom designed and successfully engineered solution. Dimensions - Weight 385 TONS & 407 TONS THE CHALLENGE - To ‑nd a custom solution to top and tail the complete fabricated structure and align it with the base jacket structure. OUR SOLUTION - A selection of 3 cranes were used. 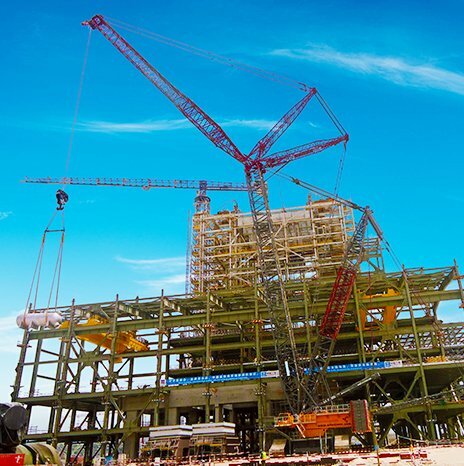 Our Liebherr 600 TON crawler crane with 84.0M boom SDBW was used as the main crane, a 400 TON crawler crane with 64.0M boom and our Liebherr 1200 TON mobile crane were used as tailing cranes to successfully top and tail the entire structure and then carefully position it over the base structure for welding. To erect a DHT reactor. Our challenge was to place our 1000T crawler crane with self weight 800T along with 500T mobile crane used as tailing crane. The most difficult challenge was to position the 2 cranes near an excavated area. Ground pressure calculation was done to know the load released. We used steel plates to reduce the ground pressure. Calculation was also done for top and tail operation to choose the crane best suited for the operation. After the top and tail operation the crawler moved with a 204T load to reach the foundation at 36m. 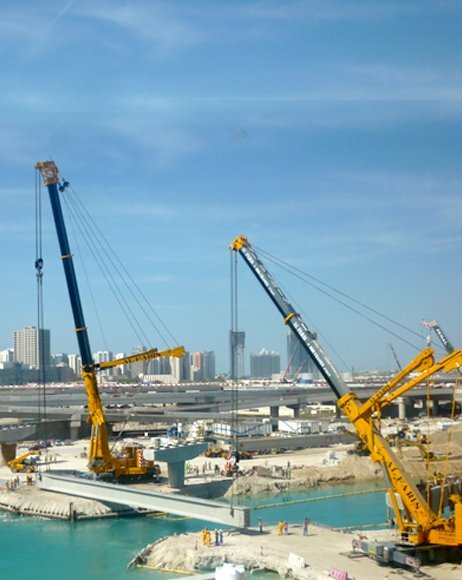 Lifting of 8 Girders of the Bridge to link Al Mariyah Island with Al Reem Island in Abu Dhabi. 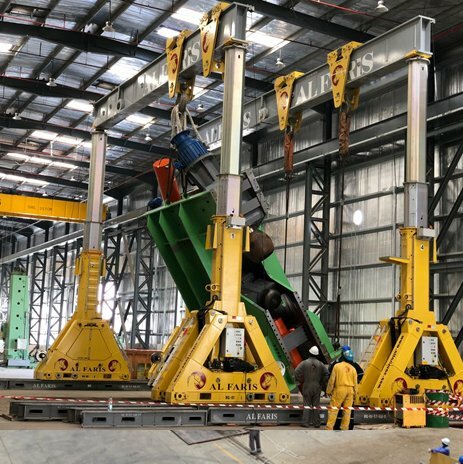 Major challenges were space constraints, limited crane set up area and access, large lifting radius and highest precision requirement for the job. Girders were lifted into place by tandem operation using the largest mobile crane available in our fleet LTM-11200-9.1 (1200T) and LTM-1500-8.1 (500T). 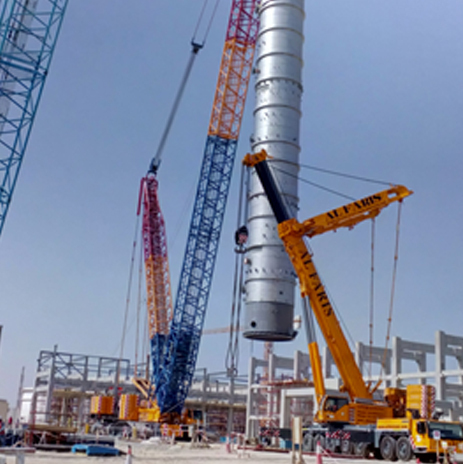 The 1200T crane was positioned at Al Mariyah Island and the 500T crane was positioned at Al Reem Island. 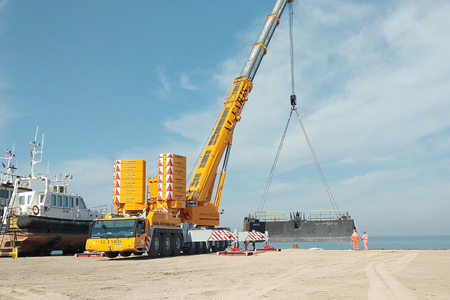 Girders were delivered to Al Mariyah Island and were initially lifted using our single 1200T crane, swung across the island so that one end of the girder reached Al Reem Island. The Girder was then lowered on the ground and lifted onto final position on bridge pier by tandem operation using 2 cranes. We were hired to provide a multi-crane lift solution due to the preference of construction of large structures at ground level and the requirement to lift the complete structure into final position. Major problems faced were the non-availability of lifting points and the irregular angled top surfaces. A combination of 5 Liebherr mobile cranes was used; 400T mobile crane, 500T mobile crane and 1200T mobile crane with luffing-jib combinations for the main lift. 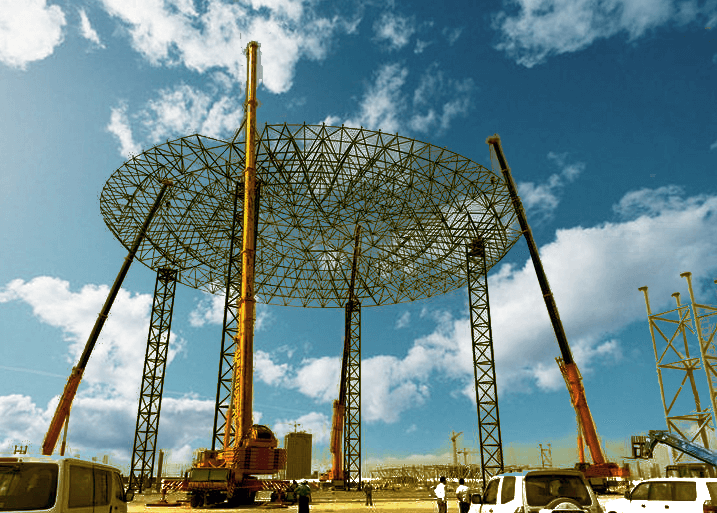 Also 50T and 70T cranes with man baskets were used for aerial works. Rigging tackle design included choke hitched tie chains with suitable protection along with shackles to balance the irregular structure. Also the loads on each crane were monitored for respective uniformity based on our pre calculations. To find a custom solution to load and transport the complete fabricated vessel from vendor yard to port. Hydraulic multi axle trailers were used for this operation. 2 files of 15 axle conventional trailers with 540 HP ballested truck were used to load the cargo by using the self jacking system of the trailers. This also helped with the narrow roads and other obstacles. The whole operation has to be carried out inside a warehouse with a headroom of 12.9m. The lifting equipment had to be assembled 7m away from the installation location(foundation). As per the site inspection, crane option was ruled out thus using SBL900 gantry system with max. capacity of 900T(225.0t cap/ram) and a reach of up to 11.3m to execute the job. Initially the flanging machine was rotated 90 degrees using a turn table. Top of tail of the machine was completed using the gantry system. The gantry along with the flanging machine was moved near the foundation and as per the clients requirement the machine was aligned and installed over the foundation. 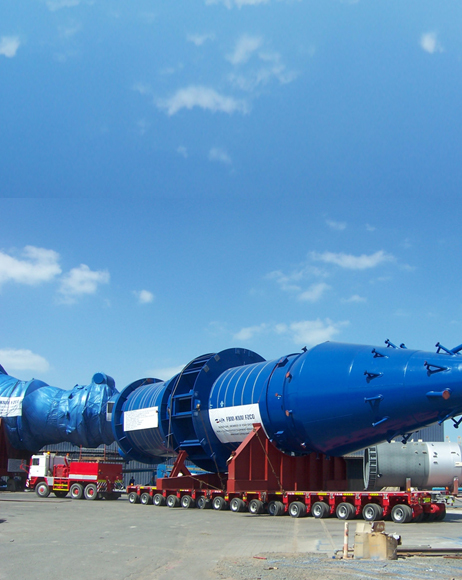 Four offshore leg structures had to be transported from their fabrication yard within a short time period to the port where they had to be installed on to the rig. The main challenge here was to transport the abnormally long rig legs through narrow bending roads full of unavoidable obstacles. We used 2 file wide, 18 axle Goldhofer conventional multi-axle trailers configured with turntable bolster attachments for the transportation. Upon reaching the destination the legs were top and tailed upright using our Liebherr 600T crawler crane as the main crane and our 250T Kobelco crawler crane as a tailing crane completing a successful transport and installation within a record time. To find a custom solution to top and tail the complete fabricated structure and align it with the base jacket structure. A selection of 3 cranes were used. 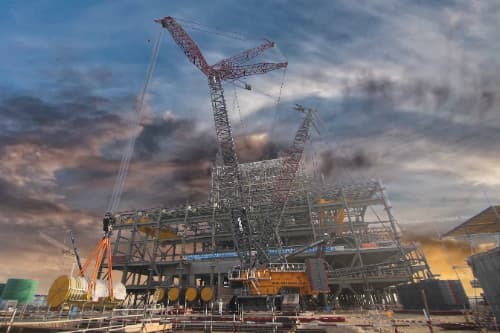 Our Liebherr 600T crawler crane with 84.0M boom SDBW was used as the main crane, a 400T crawler crane with 64.0M boom and our Liebherr 1200T mobile crane were used as tailing cranes to successfully top and tail the entire structure and then carefully position it over the base structure for welding. To lift 12 heavy various sized power equipment, the largest weighing 404T in confined spaces between structures. Our 1000T crawler crane was used with SDWB2 configuration (main boom – 48.0m, luffer – 30.0m) while lifting the 404T generator which was one of our most impressive heavy lifts by a single crane. The entire execution included lifting of the generator from the hydraulic trailer and maneuvering the crane with the load towards the foundation which was approx. 10m distance away to achieve the planned radius. The load was then hoisted to a height of 30m and rotated over a high rise steel structure and slowly lowered to approx. 15m within the narrow space between the steel structures to the foundation level. The final alignment of the load was done by coordinating with the installation team. A similar lifting procedure was followed to safely lift the remaining 11 power equipment. .
Our Liebherr LR 11000 (1000T crawler crane) with SDWB2 48m Main boom & 66 luffer configuration was used as the main crane to successfully lift the HP heater and carefully position it on the installing foundation. 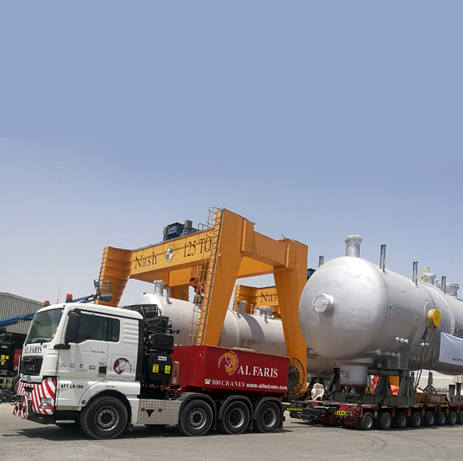 To transport the acid gas drum vessel (length: 26.7m, width: 6.1m, height: 8.1m) from JAFZA to Jebel Ali port. Our major challenge was delicate manoeuvring of the drum vessel with complicated bends and unavoidable obstacles on road. After examining the route and transport load, a selection of 2 files of 16 axle hydraulic trailer for transporting was made. The transformers were then off-loaded on to our customised stools which are made in-house. 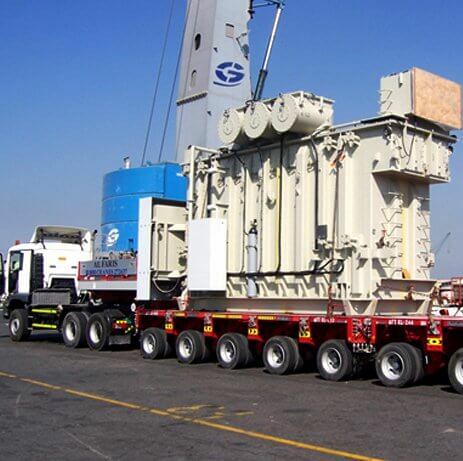 To transport the transformer (length: 8.5m, width: 3.5m, height: 3.5m) from JAFZA port to DIP storage area. Our major challenge was the storage handling for these transformers. After examining all the sites and route conditions, a selection of 2 files of 8 axle hydraulic trailer was made to execute the project. The offloading was done onto stools and beams. These certified heavy duty stools and beams have been made in-house and customised by us for our client. 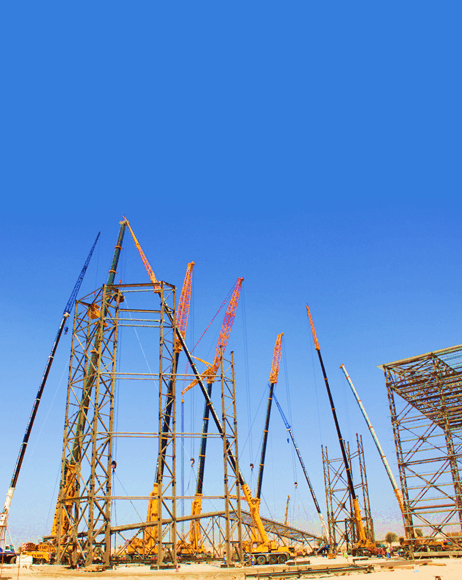 After examining the site condition, a selection of 2 cranes were made. 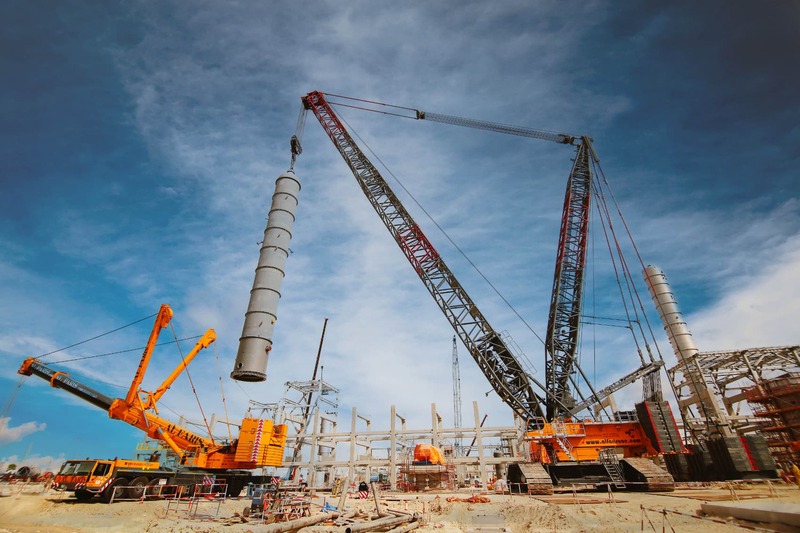 Liebherr LR 1600/2 (600T crawler crane CR-14) with SDBW 72m main boom configuration was used as the main crane and Liebherr LTM 1400-7.1 (400T mobile crane) was used as a tailing crane to successfully top and tail the naphatha splitter and carefully erect it on the foundation.